The best parings are the most unlikely ones. Maroon 5 and Cardi B's "Girls Like You" is one of the sneaky contenders for the Song of the Summer. It's hung out in the top 10 of the Hot 100 for weeks now and the band and Cardi are releasing an EP of remixes of the song by a slate of talented women. First up is a re-do of the track by St. Vincent, who brings Cardi's verse to the front and puts a more sinister beat behind her. It all works really well, a testament the skill of everyone on the track. In an email, Maroon 5 voiced their excitement for the project. 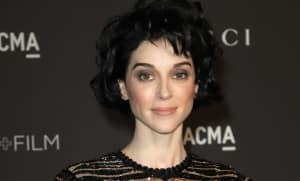 “We’re so excited that St. Vincent created a remix to ‘Girls Like You.’ The song has such an important message and were grateful to continue it with not just her, but with remixes from a few other amazing female musicians as well,” they said.